Ever since curvatures started showing up on the screens of smartphones and televisions, the march toward displays that can fold or roll up has picked up steam. Unsurprisingly, the first marquee products have been shown from consumer tech brands with sister companies that are among the world's premiere display component producers -- Samsung and LG. The former showed off a prototype of a folding smartphone at its developer conference in late fall, while the latter debuted a TV that rolls into a low-profile stand at CES. It was one of the most impressive products to debut at the storied trade show, even if others left a better taste in your mouth. Both devices stand to improve usage scenarios for their categories beyond the differentiation their merely curved predecessors offered. While I've written about some of the challenges posed by a folding phone as proposed by Samsung, the approach has its merits. The flexibility facilitates a one-handed grip when used for calls when closed while folding out to a display size closer to a small tablet when open. The LG TV would allow a big-screen TV experience in home locations, where the looming presence of a large black rectangle might detract from the decor. It also protects the display when it's not being used. However, neither product does anything to change the fundamental logistics of using these devices. The rolled LG television still requires a large surface much as a large-screen TV's stand would today. And while the Samsung phone might net you an extra inch of screen real estate, it will still demand dedicating much of a pocket as any premium smartphone would today. Samsung chose to have its folding phone fold inward to a smaller footprint. But there could be opportunity for an already-large phone that would fold or roll out into something approaching the screen area of a standard iPad versus an iPad mini. Such a device would still need to be used two-handed or stabilized on a desk or table. In many scenarios, however, it could change the game the terms of having to lug around a bag for a tablet or laptop. Of the current companies teasing foldable displays, only Royole has shown a device that folds out in this way. Its FlexPal relies on an accordion-like hinge that's visually similar to that of the Surface Book (and leaves a gap when folded like that product). Furthermore, the prototype, which obviously hasn't been optimized yet for final aesthetics, relies on Android, which yields diminishing returns when extended to full tablet size. Just ask Google, which opted instead to put Chrome OS on its latest slate device. What about Windows then? Just as Google has promised to make changes to Android to optimize for folding phones, so would Microsoft want to upgrade Windows to capitalize better on the new technology. The company has already demonstrated that it understands this potential. About a decade ago, video of a prototype device concept called Courier envisioned a folding device that opened like a book, with two screens enabling an app-free creative project management approach. Despite ARM-stirred rumors, its unlikely that the Courier concept would be revived. 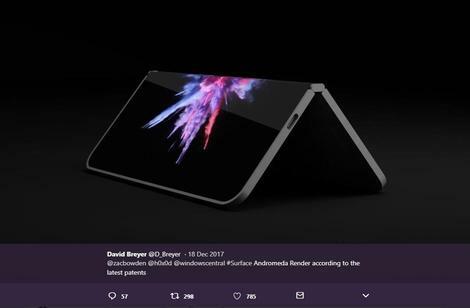 However, other reports have spread about Microsoft pursuing a folding-screen Surface device code-named Andromeda. Equipping a mobile Windows PC with a folding display would require addressing a few practical challenges as well. For example, while interesting experiments continue, to the extent that Microsoft and other Windows vendors have succeeded in the tablet market, it has been via 2-in-1s that have have rigid keyboards. That said, Microsoft and others have developed folding Bluetooth keyboards that would still offer an improvement over typing on the surface of a screen, however bendable it may be.